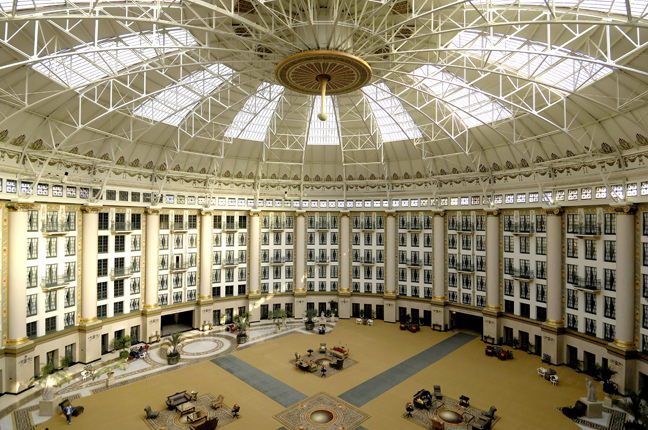 Most balconies are outdoors and have a view of the outdoors but not here at West Baden. After a devastating fire destroyed his original hotel, Mr. Lee W. Sinclair used the tragedy to create the hotel of his fantasies—a place that would reflect the grandeur of such fabled spa towns as Baden Baden in Germany and Carlsbad in the Czech Republic. 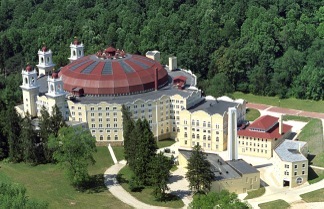 In 1901 Sinclair commissioned West Virginia architect Harrison Albright to create a circular edifice topped by the world’s largest dome. A year later, in 1902, the new hotel, with its 200-foot diameter atrium and massive fireplace that held fourteen logs opened. Sinclair’s concept was to bring the outdoors in. Indeed the sheer height and size of the building does create its own air currents and a sort of natural air conditioning. In an earlier phase, the floors were concrete, a fountain gushed in the centre and benches, statues and potted plants created the ambiance of an Old World piazza like something you’d find in the middle of Rome or Florence. On the hotel’s fascinating historical tour, my guide pointed out that the gentlemen sitting on benches and reading newspapers in a vintage photo were wearing hats. No gentleman in those days would be caught dead with his hat on if he thought he was indoors. Alas, after the stock market crash of 1929 West Baden Springs and its sister hotel, French Lick Springs fell on hard times. The Jesuits, who operated West Baden until 1964, used the area where the front desk is now located as their chapel. Magnificent stained glass doors lead out to a commodious wrap-around verandah appointed appropriately with rocking chairs. From here guests can look out onto the fountains, statuary, gardens and vintage bathhouses where the rich and famous used to come to drink the therapeutic mineral waters from crystal goblets. After the Jesuits, the building operated as a private college. Years of neglect and bankruptcy took their toll on this property that was listed as a National Historic Landmark in 1974. Trees were growing inside and more old photos show a collapsed exterior wall with a bathtub clinging to the wreckage. Today, thanks to the philanthropy and passion for preservation of William and Gayle Cook, West Baden has regained its status as a grand dame. 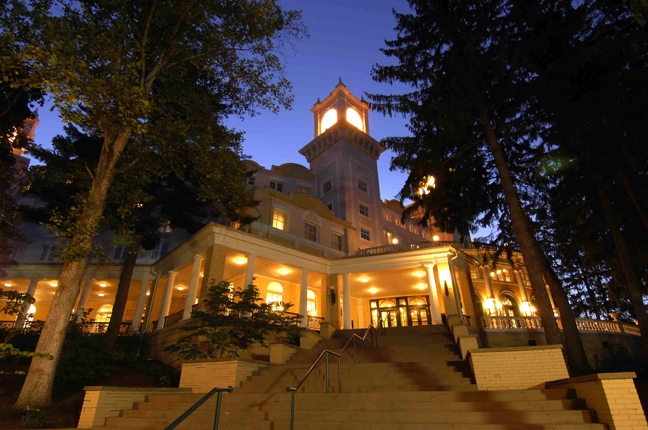 Mr. Cook, who made his fortune selling medical equipment, also restored neighbouring French Lick Springs Hotel, a mile down the road. This afternoon, when I opened my balcony doors, I heard the tinkle of china and the strumming of a harpist as guests below enjoyed traditional afternoon tea. Later in the evening, during cocktail hour, a man with a fine baritone voice belted out an aria while standing exactly in the middle so that his voice echoed clear as a bell throughout this magical space. Like a European piazza, the circular arcade behind the atrium houses various shops, the fine dining Sinclair’s restaurant and a spa where guests can still bathe in those mineral waters that put French Lick Resort on the map. 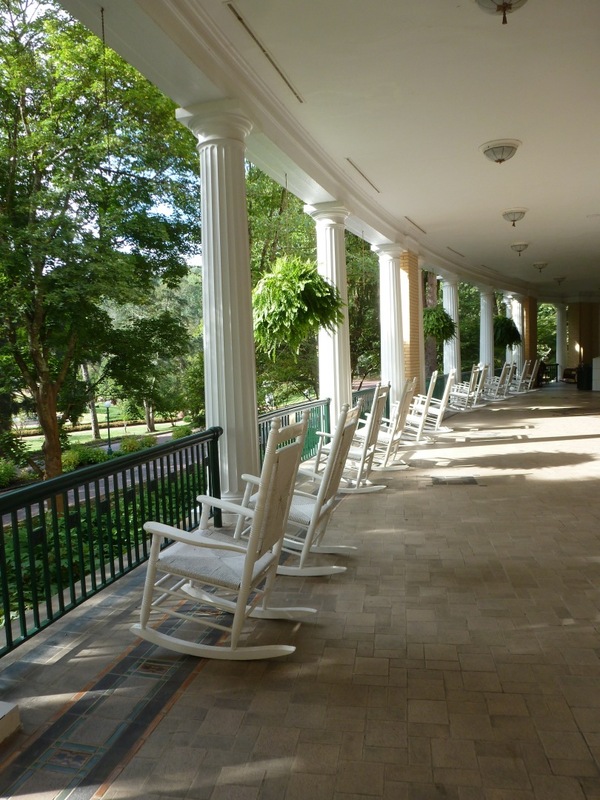 We Golf Road Warriors came to French Lick for the superb golf, but the history lesson is just one of the many added facets to this amazing resort in the middle of “nowhere” Indiana.